Last Monday, we brought up the cloud’s appeal to small businesses for the scalability and flexibility it provides. While cost efficiency is a natural concern for decision-makers, new research from Techaisle shows that SMEs are less focused on cost-cutting than in previous years. Instead, businesses are more focused on the opportunity to reach new markets and customers and developing new capabilities. Increased interest in business agility and performance doesn’t mean companies are ignoring budgets—process costs remain a top concern, especially among mid-market businesses with 100–999 employees. We’ll be digging deeper into companies’ motivations for migrating to the cloud, as well as the related challenges, in our survey and series of executive interviews—stay tuned for results. When you stop to think about it, the most enthusiastic adopters of cloud computing and the easiest companies to sell it to should be small and medium-sized enterprises. And once these companies have made successful early forays into the cloud, they can use it to support other key technologies, including mobile and analytics, in a scalable and affordable fashion. 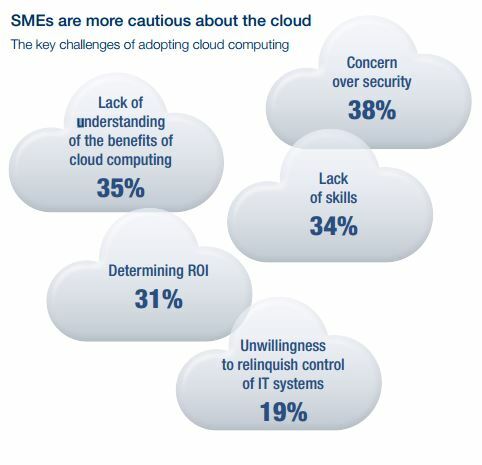 But as we saw in a recent global research project on SMEs, many smaller firms are slower to adopt cloud computing than one might expect. A couple big hurdles: Lack of understanding of the benefits, and trouble determining ROI. 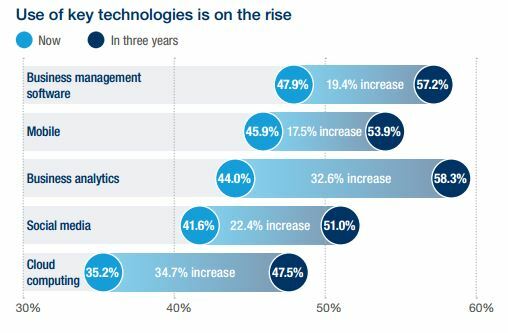 Meanwhile, willingness to relinquish control of IT systems turns out to be a minor issue. Note that the earlier research was global in scope and focused on a broader set of issues than the current, US-oriented program we are chronicling here. Still, it sets up some of the key questions we’ll be pursuing over the next few months.